CFN – Heart’s longtime love affair with Canada – and Montreal in particular – dates back almost 40 years, to the night in 1976 when they were fired from Lucifer’s nightclub in Calgary, back when Heart was just another bar band . “I made some disparaging remark about the club from the stage and we got fired that night,” Ann Wilson told me a couple years ago. But that very same night the Wilson sisters got a call from their manager: Would they like to open for Rod Stewart at the Montreal Forum? So the band hopped a train from Calgary to Montreal (“That’s all we could afford,” Ann says) and when they arrived in Montreal, CHOM-FM was the first radio station anywhere to play their music. Ann Wilson acknowledged this fact onstage at the Bell Centre last night (June 14) to 6,000 of the Heart faithful, who helped the Wilson sisters launch their 12-city cross-Canada tour with much fanfare. The Wilsons and their crack band played a standard 75-minute opening set that included their best-loved songs (with the notable exception of Magic Man), and which also included guitarist Nancy Wilson singing lead on a terrific cover of Paul McCartney’s Let Me Roll It. “I learnt the song today,” Nancy said from the stage. The first standing ovation was for the band’s 1987 massive Number 1 hit Alone. 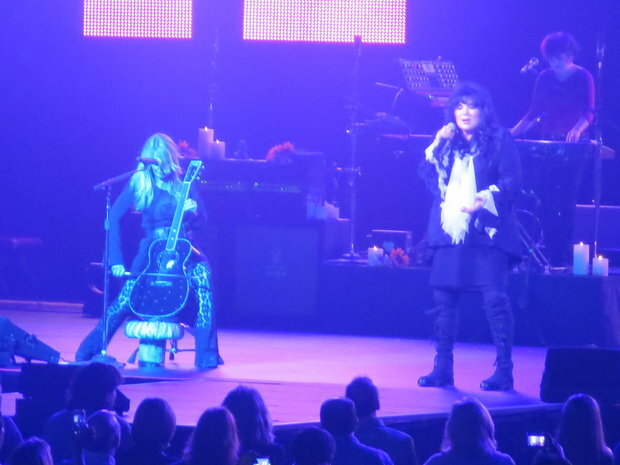 Other highlights – despite the Bell Centre’s typically bad acoustics – were the epic Heaven (never released on a studio album) and the set-closer, Crazy on You, with 60-year-old Nancy Wilson working her trademark cross-legged jump and kick moves like a rocker half her age. The real magic happened in the second half when the band – and special guest drummer Jason Bonham, son of late Led Zeppelin drummer John Bonham – played a sterling 50-minute eight-song set of Led Zeppelin classics. For decades mostly male rock critics dismissed Heart as mere Led Zep wannabes. It’s true Heart are famous for their live version of Rock’n’Roll, and Ann Wilson did a deadly cover of Immigrant Song on her 2007 solo album Hope & Glory. The band almost always includes a Led Zep track as an encore, such asWhat Is and What Never Should Be at Salle Wilfred-Pelletier in 2011, and Black Dog at the Bell Centre in 2013. But before Heart famously paid tribute to Led Zeppelin at the Kennedy Center Honors in 2012 (and before Heart themselves were inducted into the Rock and Roll Hall of Fame in 2013), Ann Wilson had met Robert Plant just once, in 2010. There’s one good reason why Plant has outright refused to do a Led Zeppelin reunion tour: He simply cannot match his old vocals. While Plant’s voice isn’t what it used to be, Wilson’s soaring vocals still rock. Plant must envy Wilson, who at 63 has lost nothing vocally to age. The set-closer was – go figure – Stairway to Heaven, the song the Wilsons and Bonham first teamed up for at the Kennedy Center Honors concert. This time around, to launch Heart’s Canadian tour, they were joined onstage for Stairway by the Quebec Celebration Gospel Choir. To be honest, the moment felt a tad anti-climactic after listening to a blistering set of Led Zep classics. But the performance was living proof that Heart is the only other rock band on the planet that should be allowed to perform that song. Photo and story reprinted courtesy of the talented, generous, and gracious Richard “Bugs” Burnett and first published on Curtainsup.tv He also blogs for the Montreal Gazette and his own long term THREE DOLLAR BILL.